The unique and rather interesting YotaPhone is launching today in India. The phone will be available exclusively through online retailer Flipkart and is priced at Rs. 23,499 ($382). 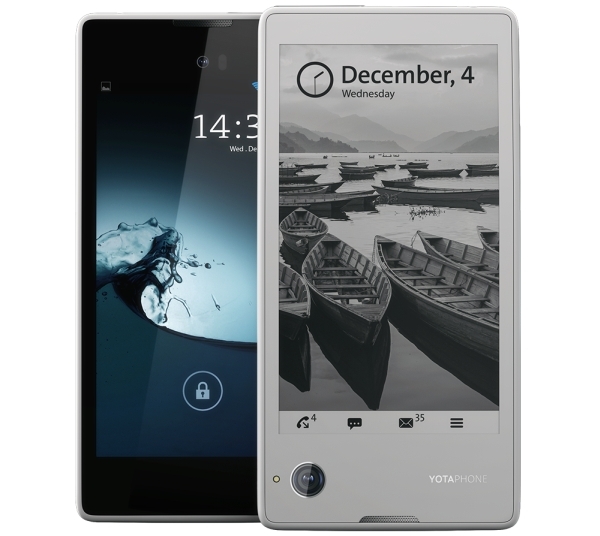 The YotaPhone is a first of its kind device with a display on the front as well as the back. The display on the front is a 4.3-inch, 1280x720 LCD but the one on the back is a 4.3-inch, 640x480 resolution electronic paper display. The second screen is what's most interesting about this phone, as it always stays on and shows information, and due to the nature of electronic paper display, that only consume power while changing states, the display is very efficient. Other than that, the YotaPhone has a Qualcomm Snapdragon 400 MSM8960T with dual-core 1.7GHz Krait 300 CPU and Adreno 320 GPU, 2GB RAM, 32GB storage space, 13 megapixel rear camera, 1 megapixel front camera, 4G connectivity, 1,800mAh battery and Android 4.2.2 Jelly Bean.